Eric Roberts is one of those actors who everyone knows. He’s starred on the big screen, small screen and the stage; he’s been nominated for an Academy Award, an Emmy Award and Golden Globe Awards. He’s been on soap operas, sitcoms, big-screen blockbusters and art-house dramas. This week, he co-stars in the UP TV original movie “The Perfect Summer” (which airs Saturday, July 13 at 7, 9 and 11 p.m. ET, and Sunday, July 14 at 7, 9 and 11 p.m. ET), doing something he’s never done before: He’s playing a grandpa. “The Perfect Summer” was a family affair for Eric. The movie features original songs by Eric’s stepson, singer-songwriter Keaton Simons, and Jason Castro, who also co-stars in the movie. (Keaton and Jason are also touring together this summer with Ryan Cabrera.) Eric’s wife, Eliza, is Jason’s acting coach. When I spoke with Eric recently, he was excited to tell me about this very different role for him, that of a nurturing grandfather and legendary surf pro. Celebrity Extra: I have to ask: You play Lou, a surfing legend; can you surf in real life? 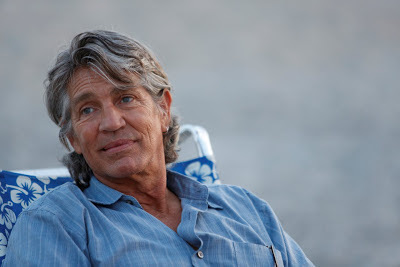 Eric Roberts: I do not surf. But I had the No. 3 long-board surfing world champ as my surfing double, so I look like a million bucks. CE: Tell me about the movie. ER: It’s a coming-of-age movie. My grandson (played by Adam Horner) and daughter (played by Sydney Penny) come to live with me, and I see he is sticking out like a sore thumb, so I tell him to try surfing. People dig surfers. He tries it out, but complains. I tell him to either do it or don’t, but see how good you can be when you try? I give him hope, and he takes it to the bank. He gets his self-esteem back, feels a sense of accomplishment, and comes out a personal winner. It’s a gentle, sweet story. CE: You’ve played every type of character I can imagine — what made you want to play Lou? ER: I haven’t been a grandfather yet. As you know, most roles I’ve played have been anything but normal, and I am not really the grandfather type. I enjoyed playing that. Playing a guy who is normal was fun for me. Grandfathers can be hip! I’ll tell you, I’m in my early 50s, and I had to be at the beach with all these surfers, so it was double gym time for me. But it was a pleasure to make this movie. This is a story that’s valuable to everybody. CE: I know you are vegan. What made you decide to adopt that lifestyle? ER: First of all, it’s really hard when you’re on the road [filming] in the South. But you don’t have to kill animals to eat. I just don’t like the idea that we slaughter so many beasts to eat. So I asked my wife to help me be a vegan. She leads me around by the nose when I am home and keeps me on track. When I’m away, I’m a vegetarian.